Isn’t it a delight to hear “Mummy are unicorns real?” We know how important mythical creatures and folklore are to children’s development. According to psychologists, creating and sustaining imaginary friendships is a great way for pre-schoolers to practise social skills. 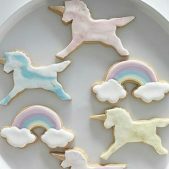 So why not let your little one’s imagination go wild with unicorns? 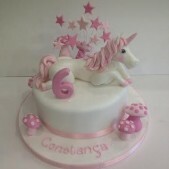 We love the wonder of children’s imaginations so much we’ve created a range of beautiful unicorn cakes. Children love to use their imaginations and conjure up magical stories full of wonderful creatures, and unicorns more often than not make a magical appearance. 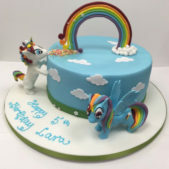 At Cakes by Robin, we love to use our imaginations too, and we’ve had the time of our lives making the most unique and beautiful cakes you could ever imagine. When your little one tells you they’ve been skipping through the fields close to a forest and glimpsed a unicorn amongst the trees, tell them they’ve been lucky, because only very lucky children get to see unicorns. 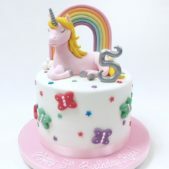 If they are really lucky, they’ll get to gasp at one of our amazing unicorn birthday cakes soon as well. 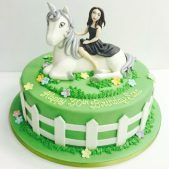 If your child obsesses about fairy-tale creatures, why not make their next birthday a special one with a beautifully handcrafted cake? 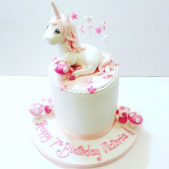 Our unicorn cakes are as magical as the mystical creatures themselves. 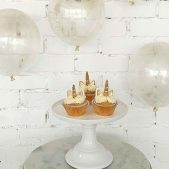 In fact, why not make your little one’s birthday party a unicorn theme? We can help you with a whole range of goodies to bring your dessert table to life. 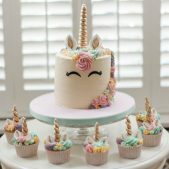 Our unicorn themed dessert tables are a truly magical sight to behold. Our cupcakes with delicious frostings topped off with a unicorn’s horn alongside special iced cookies are a feast for the eyes. 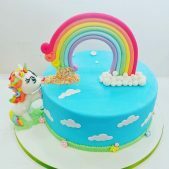 With a centrepiece unicorn cake, it makes a dessert table with a magical glow. It’s a glorious sight for any little one on their birthday or for any special occasion. 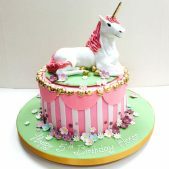 Adults love our unicorn cakes just as much. 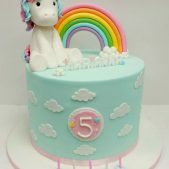 If you know there’s a magical child in any of your adult family or friends, we know they’d love a unicorn birthday cake as much as any child. At Cakes by Robin we don’t believe in ordinary. We have a wonderful range of cake choices and flavours to bring out the magic in everyone. 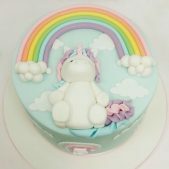 Guests young and old will love our unicorn cakes, whether you choose a daring red velvet cake or a simple vanilla Victorian sponge. Our absolute favourite is the rainbow coloured sponge cake. It’s a real showstopper. 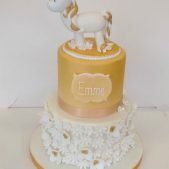 We’ll deliver to locations within and around London, or you can collect from our cake studio in South West London. Ordering a cake from Cakes by Robin couldn’t be easier. 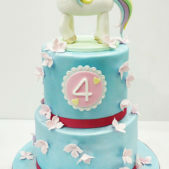 Our unicorn cakes embody everything that is magical and wonderful about childhood. And they are as magically scrumptious as they look.